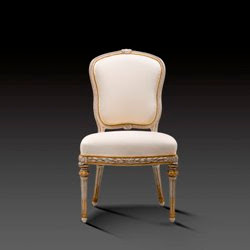 This Transition Style chair is of a superior quality and shows, without any doubt, that it was associated with other elements such as couches, fire-screens and footstools. Integrated in the rare and beautiful cabriolet suite of the "transition" era, this very nice armchair exposes the same design, at one time with curved lines, at another time with straight lines of a style that skillfully reconciliates the extremes and embellishments of classical motifs hereby giving them grace and balance. 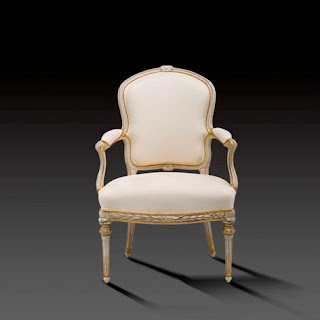 This remarkable bergère that is part of a suite stamped BOVO, combines the audacity of converging curves of the end of the XV style to the more discreet straightness of an early, more classical Louis XVI style. This happy communion gives an irresistable charm to this very well balanced work. 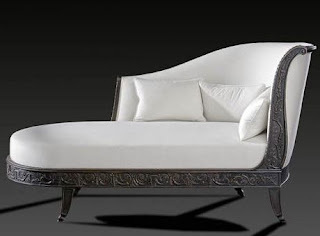 Remarkable is the rare particularity of upholstery of the sides only on the outside of the armrests. 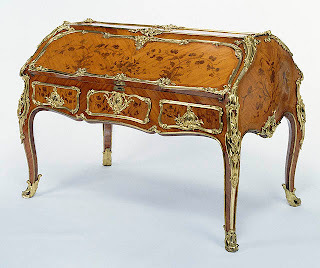 This exceptional detail of this antique furniture reproduction can also be found on another bergère of the same author, however, less inventive, in the castle auvergnat d'Aulteribe (national historical monument of France) . 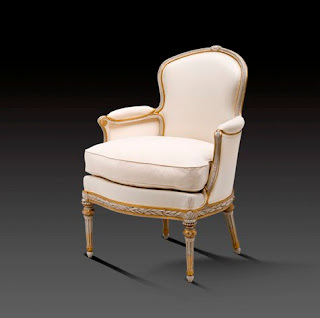 The bold curves of the Louis XV Armchair elements are balanced by the straight shafted Louis XVI Chair legs and an almost straight horizontal rail . 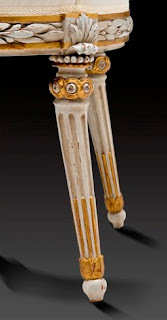 The ensemble is ornamented with neo-classical motifs : acanthus leaves, pearls, intertwining leaves, leaved legs, fluting, rails with laurel and fruit designs, rosettes in the shape of a sunflower. Each element of this almost gracile suite shows an undeniable balance, an extraordinary grace and a not often seen mastership of style.